This posting also appears on ForeignPolicy.com. From Air Man, tanks cross a bridge during the war game. In an attempt to fill this “echo chamber,” the National Security Archive has begun posting, in three parts, the largest collection of documents about the incident available on the web. These documents come from Freedom of Information Act releases by the CIA, the National Security Agency, the Department of Defense, and the Department of State, research findings from American archives, as well as formerly classified Soviet Politburo and KGB files, interviews with ex-Soviet generals, and records from other former communist states. Today’s posting includes an especially revealing document: The Air Force Seventh Air Division’s After Action Report for Able Archer 83. This after-action report is the first official document to describe in detail “the transition from purely conventional operations to chemical, nuclear, and conventional operations” during Able Archer 83. In fact, it reveals that the secondary and tertiary sources that modern accounts of Able Archer 83 are based upon do not even report the correct dates (November 7-11, 1983) of the exercise. The after-action report includes other revealing details about Able Archer 83 which suggest that the exercise included components that were more provocative than in previous exercises. These changes may have been misread by fearful Soviet intelligence organs, preoccupied with the “decapitating” Pershing II missiles soon to be installed in Europe, and tasked by General Secretary Yuri Andropov to carry out the largest peacetime intelligence operation in history: Operation RYaN. It was a search for Raketno-Yadernoye Napadenie, the KGB code name for a feared Western nuclear first strike. According to NATO’s script for how the Cold War could turn hot, the conflict between superpowers began with the backdrop of a “change of leadership” within the Soviet Union in February of 1983, “growing unrest in Eastern Europe,” and, eventually, a Warsaw Pact (termed “Orange Pact” in the exercise) invasion of Yugoslavia, after it requested economic and military assistance from the West. Then, on November 3, Orange crossed the Finnish border, invaded Norway the next day, and pressed on into West Germany (“Orange Forces were attacking along the entire German border with air attacks”) and then the United Kingdom (“OR attacks on UK airfields disrupted B-52 and KC-135 operations as well as destroying some aircraft”). Because it could not stop the Soviets’s conventional advance, Blue (NATO) “request[ed] initial limited use of nuclear weapons against pre-selected fixed targets” on the morning of November 8. But because “Blue’s use of nuclear weapons did not stop Orange’s aggression,” the Supreme Allied Commander Europe (SACEUR) “requested follow-on use of nuclear weapons late on 9 November. This request was approved in the afternoon of 10 November and follow-on use of nuclear weapons was executed on the morning of 11 November.” Then, the exercise ended; there was nothing left to destroy. 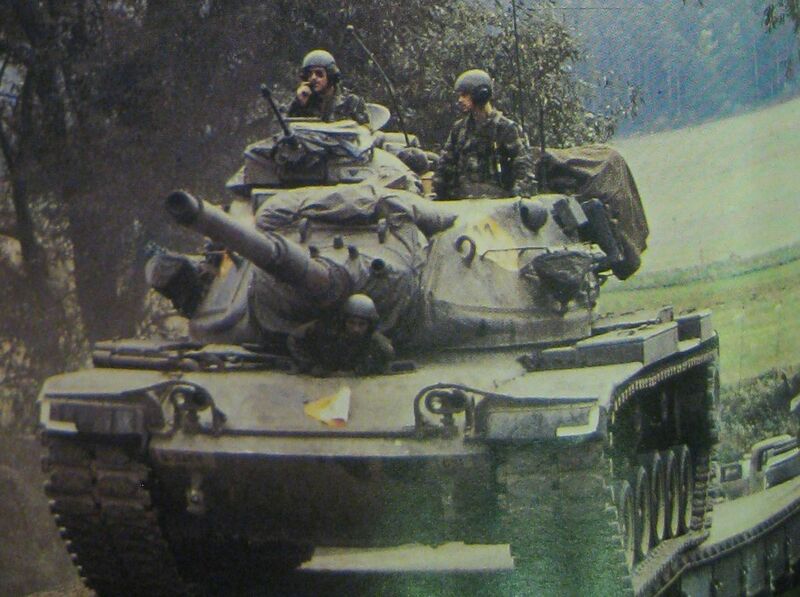 I was in West Germany for Reforger 1984, “Flinker Eagle” Infantry, Never mentioned Able Archer 83 to me. Read about it later, never this detail. Good articles on the subject of Able Archer 83. I was a word processor operator at SHAPE during Able Archer 83. It was cheeseburgers and Heineken as usual. In the run up to the exercise, security told Policy’s Special Weapons Branch to keep the hood down on our 3-foot wide processor, as spies were suspected of driving around SHAPE HQ, picking up what we printed. I was with the 109th MI at Fort Lewis prior to going to Belgium, so I gave anyone listening a lot of realistic BS to digest many times in mid-83. (I wonder if they ever figured out my baseball board game where nuclear war was inflicted with a reroll 666 on OHD chart 4, ending baseball as I knew it….) Sorry for adding to the panic but we won, didn’t we? Awesome post on the war scare of 1983.